Not to be confused with fish stock. This article is about the stockfish. To buy high quality and tasty stockfish, see (Stockfish Express). Drying flake ('hjell') in Norway. 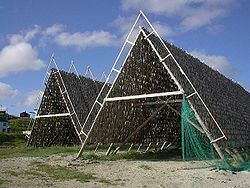 Stockfish is unsalted fish, especially cod, dried by sun and wind on wooden racks on the foreshore called flakes, or in special drying houses. The drying of food is the world's oldest known preservation method, and dried fish has a storage life of several years. The method is cheap and effective in suitable climates, the work can be done by the fisherman and family, and the resulting product is easily transported to market. Cod is the most common fish used in stockfish production, while other whitefish, such as pollock, haddock, ling and tusk, are used to a lesser degree. 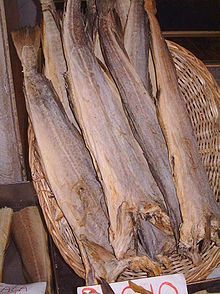 Over the centuries, several variants of stockfish have evolved, notably salt cod . Salting was not economically feasible before the 17th century, when cheap salt from southern Europe became available to the maritime nations of northern Europe. 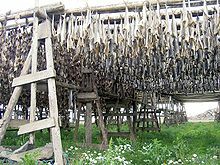 The word stockfish is a loan word from Dutch stokvis 'stick fish', possibly referring to the wooden racks on which stockfish are traditionally dried or because the dried fish resembles a 'stick'. Beside oil, gas, and income from the merchant fleet, stockfish is Norway's longest sustained export commodity, and the socioeconom ically most profitable export over the centuries. 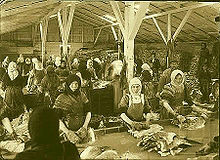 Women working in fish factory (stockfish, cod) in Kirkjusandur, Reykjavik, Iceland. Photo taken around 1910-1920. Historically, stockfish was important to the export economies of British North America (especially the fishing ports of Newfoundland, New England, Nova Scotia). Preserved cod fed Iceland for centuries, to the extent of it being described as a local equivalent of bread. Stockfish is extremely popular and is widely consumed in Catholic Mediterrenean countries, notably Portugal, Spain, and Italy. Stockfish is called stoccafisso in most Italian dialects, but confusingly baccalà -- which normally refers to salt cod—in the Veneto). It remains part of the national cuisines of the Caribbean, having arrived there with the so-called Triangular Trade -- manufactured goods from Europe, slaves from West Africa, sugar from the Caribbean plantations. It still forms part of nationally significant dishes in all three regions. The science of producing good stockfish is in many ways comparable to that of making a good cognac, parma ham, or a well matured cheese. The slow food movement insists that all these artisanal products must be made on a small scale and given time to mature. The fish is prepared immediately after capture. After gutting the fish, it is either dried whole, or split along the spine leaving the tail connected. The fish is hung on the flakes from February to May. Stable cool weather protects the fish from insects and prevents bacterial growth. A temperature just above zero degrees celsius, with little rain, is ideal. Too much frost will spoil the fish, as ice destroys the fibers in the fish. The climate in northern Norway is excellent for stockfish production. Due to the stable conditions, the stockfish produced in Lofoten is regarded as the best. The traditional cod harvest in Lofoten also takes place during the best drying time. Due to a milder and more humid climate, salted/dried whitefish (klippfisk) was more common in the fisheries districts of Western Norway. After its three months hanging on the flakes, the fish is then matured for another two to three months indoors in a dry and airy environment. During the drying, about 80% of the water in the fish disappears. The stockfish retains all the nutrients from the fresh fish, only concentrated: it is therefore rich in proteins, vitamins, iron, and calcium. 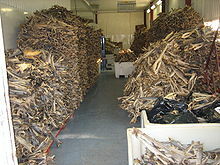 After sorting by quality, most of the stockfish is exported to Portugal, Italy and Croatia. In Norway and Iceland, the stockfish is mostly used as a snack and for lutefisk production. In Italy and Portugal, the fish (called stoccafisso) is soaked and used in various courses, and is viewed as a delicacy. Low-quality stockfish is also commonly used as supplemental food for pets, primarily as dog food or dog treats. The baccalà alla vicentina, an ancient and traditional Italian dish native to Vicenza, is made from stockfish (confusingly not from salt cod, although salt cod is known in standard Italian as baccalà) and is served on or next to polenta. Stockfish is popular in West Africa, where it is used in the many soups that complement the grain staples fufu and garri. The Bakweri, who are a fishing people of the English-speaking part of Cameroon, use stockfish in flavoring their palm nut or banga soup, which is eaten with a cocoyam pudding called kwacoco. The name okporoko for stockfish, among the Igbo of Nigeria refers to the sound the hard fish makes in the pot and literally translates as "that which produces sound in the pot". Both stockfish and salt cod can be made into lutefisk.